What is the proper way to store a pomegranate? How long can they be stored for at room temperature? 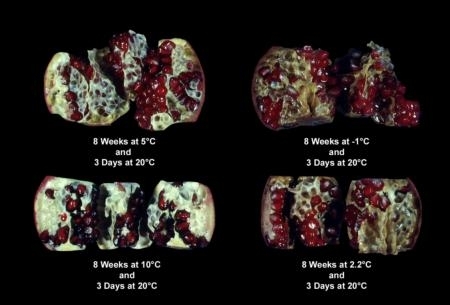 Would refrigerating pomegranates cause any problems (I'm a little worried about the fridge getting slightly to cold, freezing the seeds and ruining the fruit). Whole fruits can be stored for a month in a cool, dry area, or refrigerated up to two months. The seed pips can be frozen in an airtight bag up to one year. Fresh juice should be refrigerated and used within two to three days. In my experience in a very dry climate (Colorado) after a couple weeks the skins become desiccated and very hard—you need to saw through them with a serrated knife—but the seeds are still mostly unaffected. They will shrink somewhat, but still remain unspoiled and flavorful. The minimum safe storage temperature is 5°C (41°F) for up to 8 weeks, if decay is not a problem. For longer storage, the temperature should be at 7°C (45°F) to avoid chilling injury, but decay […] and weight loss may become a limitation. Sorry that the photo is not better quality. Not the answer you're looking for? Browse other questions tagged storage-method fruit refrigerator pomegranate or ask your own question. How do I use fridge's super cooling properly?